English Church, Hooghly [The Old Dutch Church, Chinsura]. 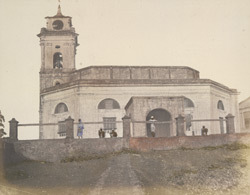 bl.uk > Online Gallery Home	> Online exhibitions	> Asia, Pacific and Africa Collections	> English Church, Hooghly [The Old Dutch Church, Chinsura]. A hand-coloured print of the Old Dutch Church, Chinsura, from the Fiebig Collection: Views of Calcutta and Surrounding Districts, taken by Frederick Fiebig in 1851. Chinsurah, on the right bank of the river Hooghly, was a Dutch colony from the seventeenth Century, it was ceded to the British in 1825 in exhange for English possessions in Sumatra. View from the river frontage looking up towards the east façade of the church, with the porch in the centre and the tower at the south end on the left. Originally built as the church of the Dutch settlement of Chinsura, the tower was erected in 1742 by J.A. Schiterman and the main body of the church added in 1767 by Sir George Vernet. This is probably a unique photograph of the church before the loss of the original tower in the 1864 cyclone.